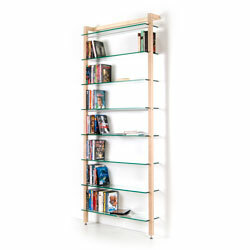 Wall-mounted DVD shelving unit for 100 DVDs. 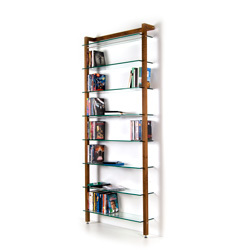 A frame of solid wood - cherry tree wood - and aluminium holds 5 security glass panes, which provide much space for your DVD-Film collection. Simple assembly. Also available for CDs. This wall-mountable DVD rack stores up to 100 of your DVDs. 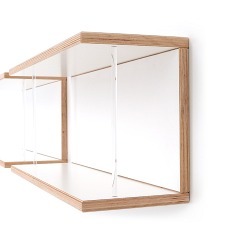 Made of birch plywood with a white melamine film finish. No visible wall fittings. Acrylic rods on both sides prevent the DVD-cases from tilting (rods may be omitted). Simple assembly. 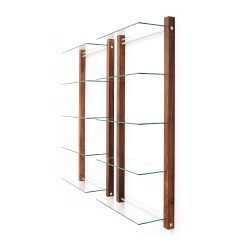 One set contains 2 complete shelves. 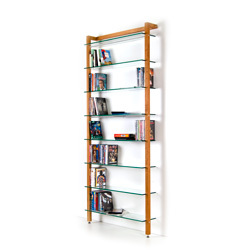 Wall-mounted DVD shelving unit for 100 DVDs. 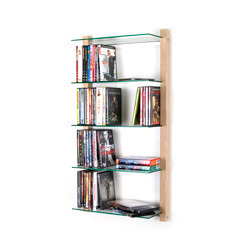 A frame of solid wood - ash tree wood - and aluminium holds 5 security glass panes, which provide much space for your DVD-Film collection. Simple assembly. Also available for CDs and in cherry or walnut wood.